Vansh Bajaj was joint top scorer for Peterborough Town against Brixworth with 49. A top three finish in the Northants Premier Division and personal pride is all Peterborough Town have left to play for this season. 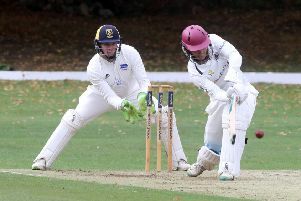 The city side’s title hopes all but disappeared with a disappointing four-wicket defeat at Brixworth last Saturday (August 18). Town, who have just four matches left to play, did move up to second in the table, but they have played a game more than leaders Finedon and third-placed Old Northamptonians. Town will be hoping star men Rob Sayer and Lewis Bruce will be available for tomorrow’s (August 25) home game with Brigstock. Sayer was in decent bowling form as Cambs beat Norfolk by 31 runs in the Unicorns Championship last weekend, taking 6-83 in the first innings. Market Deeping face a big Lincs Premier Division relegation game at home to Alford (noon). Deeping were badly beaten at Woodhall Spa last weekend and are now just 12 points clear of their weekend visitors, who sit in the last relegation spot, with four games to go. There’s a Cambs Division Two derby at Stamford Town on Saturday (12.30pm) when Ufford Park are the visitors. And the Rutland League’s John Wilcox Trophy Final takes place at Barnack on Monday (August 27, noon) when Wisbech are the visitors. What sort of side Wisbech put out is questionable as the Fenmen also have a Cambs Division One game at Histon on that day. Premier Division (noon): Peterborough Town v Brigstock, Rushden v Oundle. (noon): Lincoln v Bourne, Market Deeping v Alford. Division One (12.30pm): Eaton Socon v Wisbech, Ramsey v March. Division Two (12.30pm): Castor v Huntingdon, Stamford Town v Ufford Park. Division One (12.30pm): Bourne v Weldon, Oundle v Wisbech, King’s Keys v Peterborough Town. (noon): Bourne v Boston, Grantham v Market Deeping. Division One (12.30pm): Histon v Wisbech.Division Two (12.30pm): Cambridge St Giles v Castor, Great Shelford v Stamford Town. John Wilcox Trophy Final (noon): Barnack v Wisbech (at Barnack).